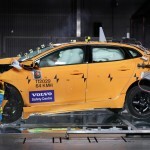 We all know Volvo doesn’t really muck about when it comes to making sure its cars are safe. Small wonder then that the Swedish manufacturer is behind what is set to be the world’s first large-scale autonomous driving experiment. Known officially as the â€œDrive meâ€”Self-driving cars for sustainable mobility,â€ the project is a collaboration between Volvo, the Swedish Transport Administration, the Swedish Transport Agency, Lindholmen Science Park, and the city of Gothenburg, Sweden. Kicking off in 2014, it won’t take the form of a one-off event either. That makes sense, given that it’s meant to help pin-point the social benefits of autonomous driving. In order to fulfill that remit, it will include the development of a user interface and cloud-based functionality. The pilot will involve self-driving cars using approximately 50 kilometres of selected roads in and around Gothenburg. These roads are typical commuter arteries and include motorway conditions and frequent queues. â€œOur aim is for the car to be able to handle all possible traffic scenarios by itself, including leaving the traffic flow and finding a safe â€˜harbourâ€™ if the driver for any reason is unable to regain control,â€ explains Erik Coelingh, Technical Specialist at Volvo Car Group. The project also includes fully automated parking, without a driver in the car. This allows the driver to walk away from the car at the parking entrance while the vehicle finds a vacant spot and parks by itself. The vehicles used in the project will not however be 100% autonomous. Instead, the vehicles in the pilot project are defined as Highly Autonomous Cars, according to the official definition by the Federal Highway Research Institute (BASt) in Germany. In practical terms this means that the responsibility is handed over to the vehicle, which can handle all driving functions at the driver’s discretion. The driver is expected to be available for occasional control but with a sufficiently comfortable transition time. Volvo hopes to have 100 autonomous cars on the road, participating in the project by 2017.